models completely assembled as required. The enclosures are made of glass reinforced thermoplast. This enclosure design is totally insulated, corrosionresistant, has high mechanical impact strength and is extremely water, dust and oil tight. All actuating heads can be turned in 90º stops, to the position required. Also, in order to meet more applications, besides the standard actuating heads, other heads such as the angled lever roller, actuating rod and spring actuating rod are available. The plunger head can be actuated in the direction of the plunger axis and with a drive it can be actuated in every direction perpendicular to the plunger axis. 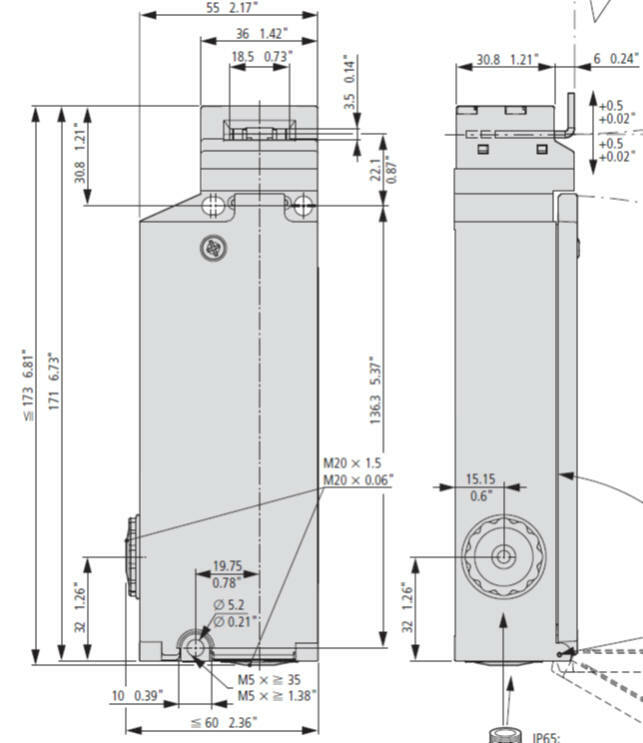 If the limit switch application has a high speed operating sequence or the drive cam has a long operating stroke, these actuating heads are ideal because of their long wear rollers. These actuating heads can be operated horizontally as well as vertically. for a final adjustment in the field. This model can be actuated from any direction perpendicular to the spring rod axis. The head can be used with objects with irregular shapes; the spring rod absorbs strong vibrations and, therefore, the snap-action switch is actuated only as required. The operating head can be turned manually in 90 degree stages to match the specified actuating surface and direction of operation. Care should be taken during mounting and operation that no foreign particles penetrate the entry point of hte actuator element. For IP 65 protection use cable entry clamp. THE "MT" SERIES REQUIRES POWER TO DEPLOY THE LOCK. When the proper voltage is applied to the A1 and A2 coil terminals the solenoid is activated and the pin is pushed into the actuator opening. It is available in two models, the first being the "S11" which has a normally open cover switch contact that closes when the cover is opened or the "S02" model that has the opposite and the cover contact is open when the cover is open. THE "FT" SERIES REQUIRES POWER TO RELEASE THE LOCK. 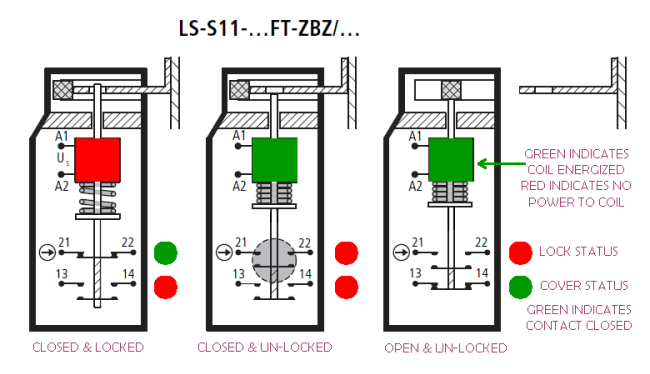 When the proper voltage is applied to the A1 and A2 coil terminals the solenoid is activated and the locking pin is pulled back from the actuator opening, therefore releasing the lock from it's fail safe spring return locked position. Even with a power failure the door or cover will remain locked. A manual release is also provided. By reliable securing and interlocking of protective doors, the LS-ZBZ increases the safety standards for the protection of personnel and processes The LS-ZBZ operates according to one of two principles: on the basis of magnet-powered or spring-powered interlocking. Using the magnet-powered design, the protective cover is interlocked when operational voltage is applied, and can therefore be opened directly in the event of power failure. The spring-powered scheme ensures that the door or protective guard remains safely locked even in the event of power failure. 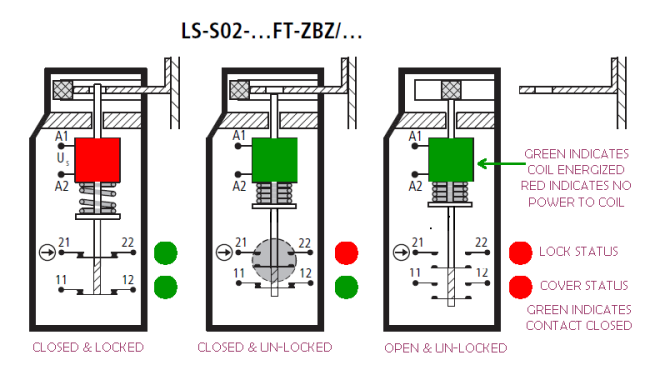 The interlock is released when power is applied to the LS-ZBZ. This means that personnel are protected from overrunning machines. 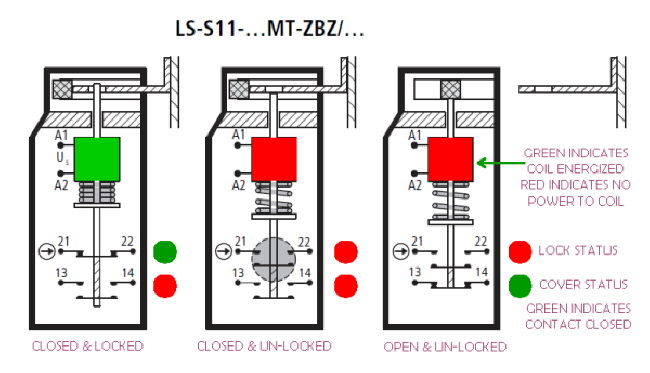 This variety of the LS-ZBZ only opens once the potentially dangerous movement has ceased. In an emergency, the protective guard can be opened using an auxiliary release mechanism. 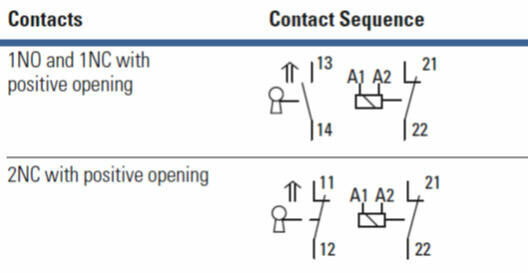 Via a second switching contact, dangerous processes can be monitored from the control station.